Get the lowdown on the various types of nail guns available—and check out our top picks in each category—to choose the best tool for you. 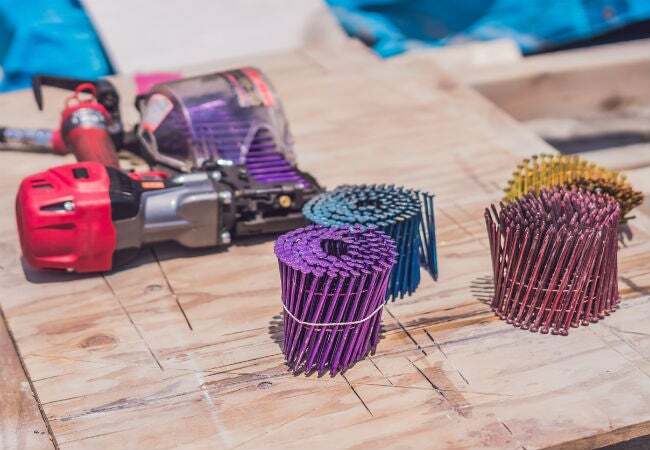 Whether you’re repairing a roof, redoing your wood floors, or starting another major do-it-yourself project, chances are you’ll want a nail gun (also called a “nailer”). 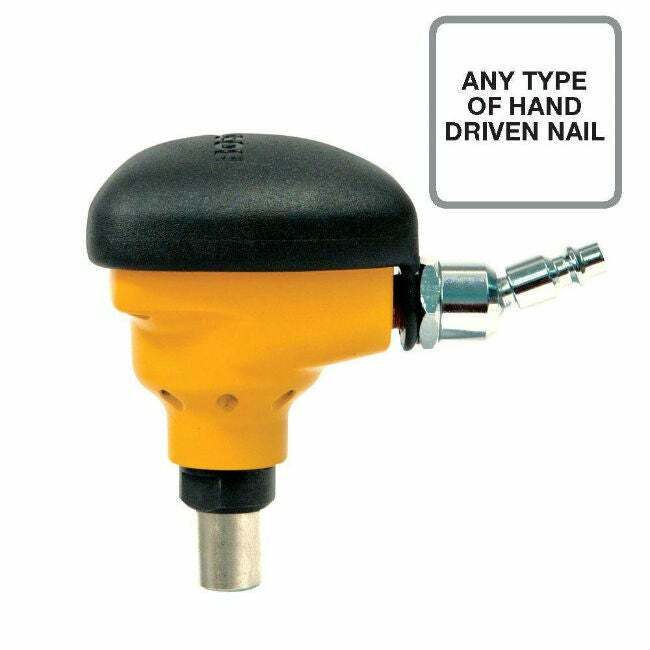 This handy power tool drives nails or other small hardware deep into the surface of wood without splintering or otherwise harming its structural integrity. Today’s nailers are tailored to specific tasks, but they all have two power source options and two basic delivery systems. Ahead, all the info you need to get the nail gun that’s perfect for your project. When it comes to the source of your nail gun’s juice, you’ll choose from battery-powered or pneumatic. 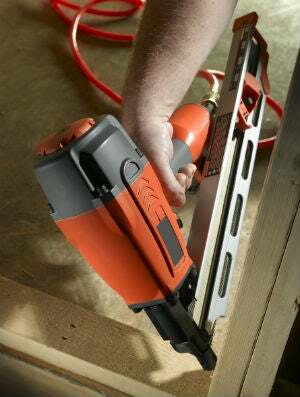 • Battery-powered nail guns are cordless, pricier (between about $130 and $400—more when you factor in the cost of the battery—totaling as much as twice the price of their pneumatic counterparts), and can deliver anywhere from 400 to 1600 shots per charge. Because they’re not tethered to a cord, they can be used anywhere, but they can weigh a hefty seven pounds or more. • Pneumatic nail guns are corded, so they can continue shooting for as long as they’re plugged in and loaded with nails or brads—no downtime for a recharge. They weigh in at two to five pounds on average and are generally less expensive than or comparable to battery-powered nailers, priced between $80 and $400, plus the expense of an air compressor (if needed). Thanks to their light weight, easy handling, and long runtime, pneumatic nailers remain the more popular choice among DIYers. Nail guns deliver their hardware with either a coil nailer or a strip nailer (also called a “stick nailer”), terms that refer to how nails are housed inside the tool. Because coil nailers hold nails in a tight coil, they offer a larger capacity, allowing you to shoot more nails in rapid succession. Stick or strip nailers hold nails in a straight line, so they take a bit longer to load and shoot. If you’ve got a large, time-consuming project, opt for a coil nailer that won’t slow you down. The expression “the right tool for the job” has never been truer than in regard to nail guns! Select yours based on the task(s) you need it to perform from this list of the six most common types of nailers. We’ve researched the best nail guns based on the criteria above and consumer reviews for each category so that you don’t have to delay your project by standing at the home improvement store. Framing nail guns are the go-to when you’re putting up wood framing and need a fast tool to secure it firmly. 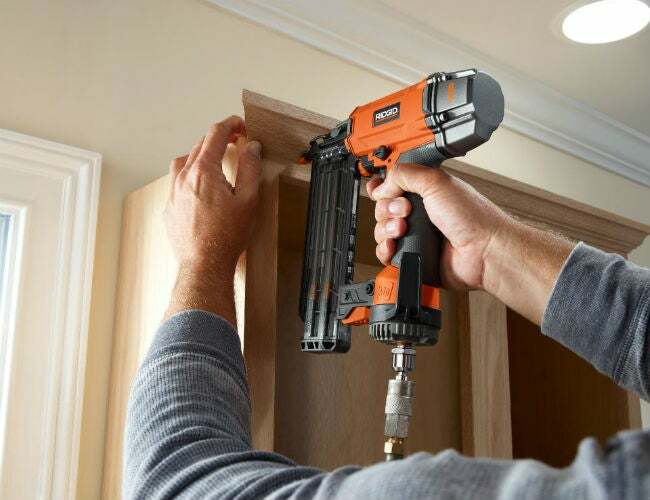 A framing nailer offers the power and precision to hold everything in place for decades to come. 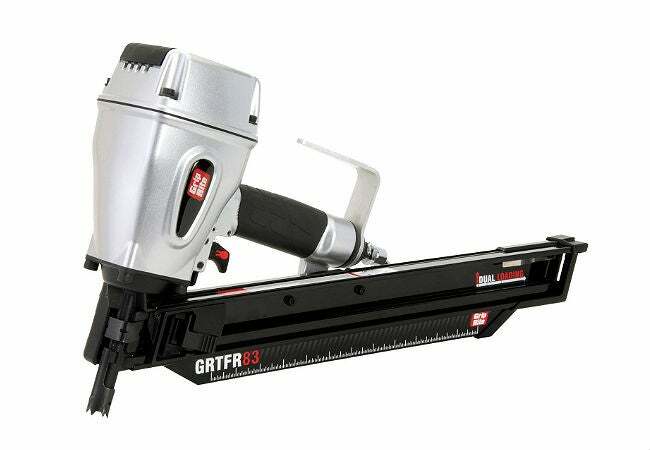 In Pro Tool Reviews’ roundup of the best framing nailers, this lightweight, dual-magazine pneumatic stick nailer made the grade for its easy loading capacity and its performance. Amid the review team’s top 10 choices, it was the only one with a list of pros and not one single con! Available at Amazon. 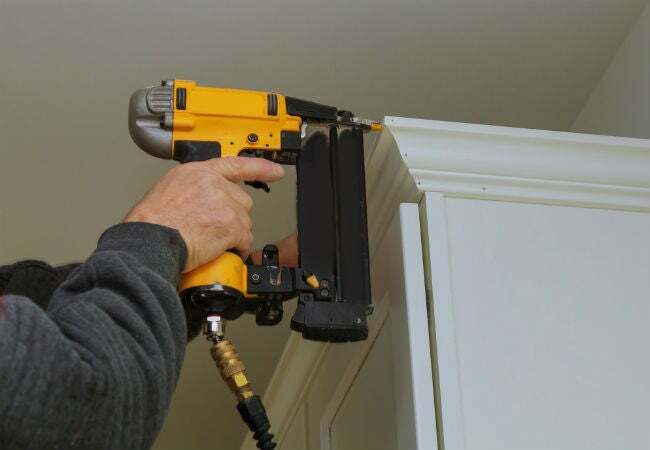 Finish nail guns are designed for installing trim, like baseboards, doorways, and chair rails. They can handle tougher projects too, like securing a standard floorboard to the drywall behind it. This pneumatic strip nailer is great for trim projects and popular among Lowe’s shoppers for its durability and consistent performance. Its swiveling exhaust portal lets you point the airflow away from your face, no matter how you’re holding the tool. Available at Lowe’s. Brad nail guns, which fire nails that are slightly smaller in diameter, called brads, are best for delicate trim projects and custom woodworking pieces in which a larger nail might ruin the wood. Particularly helpful for those who like to work in pairs on custom woodworking and delicate trim installation projects, this pneumatic brad nailer comes in pairs, or “combo” packs. Home Depot shoppers gave it high marks for durability. Available at Home Depot. Flooring nail guns, also called “cleat nailers,” secure floor planks to the sub-floor below. They serve the same general purpose as a flooring stapler but are considered superior due to the durability and longevity of driven nails versus staples. This two-in-one pneumatic tool can secure flooring via nails or staples and boasts a high-capacity magazine stick and an extended handle for comfort. Amazon shoppers give it high ratings for its reasonable price point and dependability. Available at Amazon. 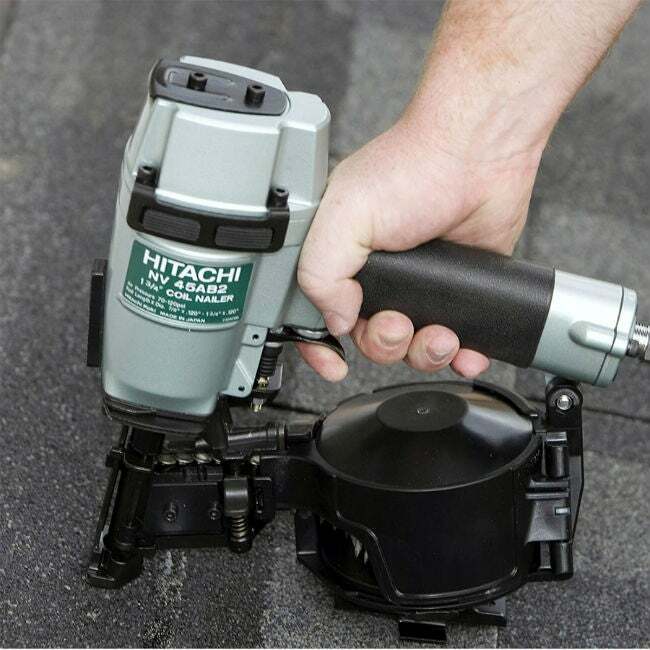 Roofing nail guns are made to drive nails into roofing materials such tar paper, asphalt, insulation, and shingles. 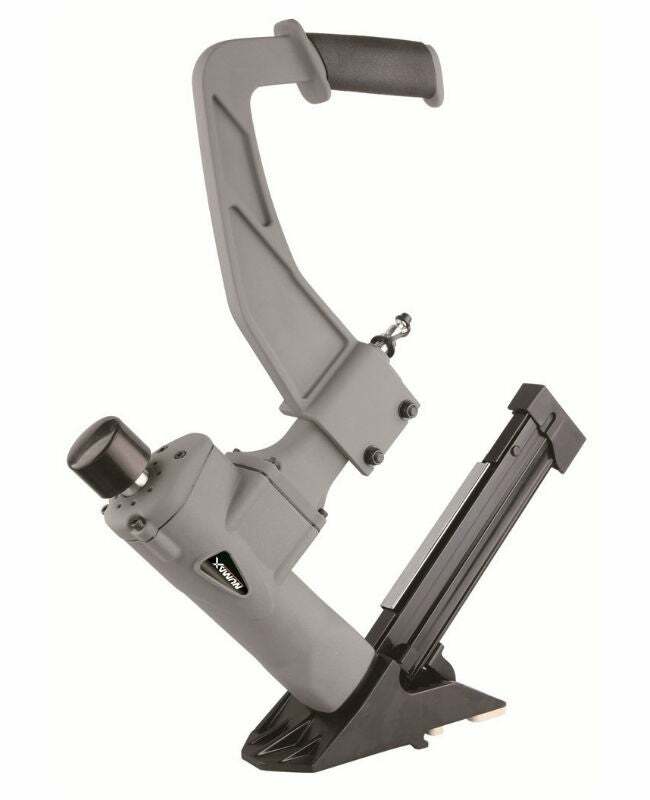 This pneumatic roofing nailer uses a side-loading magazine coil to deliver constantly until the job is done. It earned rave review from pro roofers for its durability, extra rubber bumpers, and easy loading. Available at Lowe’s. Palm nail guns are lightweight nailers that fit in the palm of your hand to deliver ultimate precision, making them the preferred tool for the tight corners and funky angles on woodworking projects. While not practical for framing or large-scale projects, they literally come in handy in close quarters. 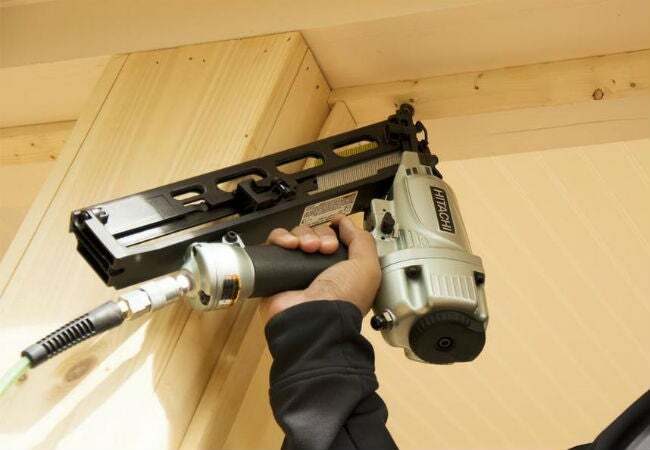 Earning a five-star rating from Home Depot shoppers because of its size, ease of use, and affordability, this pneumatic palm nailer weighs just one pound. An added perk: It’s got a front exhaust to direct air away from the user. Available at The Home Depot.